The Bottom Line: "Moses and Jesus were really prophets of Islam"
Source-Jerusalem Post: The Jewish Temples never existed, the Western Wall, the last remaining part of the last Jewish temple, was really a tying post for Muhammad's horse, the Al Aqsa Mosque was built by angels, and Abraham, Moses, and Jesus were prophets for Islam. So says Sheikh Taysir Tamimi, chief Palestinian Justice and one of the most influential Muslim leaders in Israel. Tamimi is considered the second most important Palestinian cleric after Muhammad Hussein, the Grand Mufti of Jerusalem. Tamimi, who preaches regularly from the Al Aqsa Mosque, claimed Jews have no historical connection to Jerusalem or Israel and that the Jewish Temples never existed. He claims "Israel started since 1967 making archeological digs to show Jewish signs to prove the relationship between Judaism and the city and they found nothing. There is no Jewish connection to Israel before the Jews invaded in the 1880's". The Palestinian cleric denied the validity of dozens of archeological digs verified by experts worldwide revealing Jewish artifacts from the First and Second Temples throughout Jerusalem, including on the Temple Mount itself; excavations revealing Jewish homes and a synagogue in a site in Jerusalem called the City of David; or even the recent discovery of a Second Temple Jewish city in the vicinity of Jerusalem. He said descriptions of the Jewish Temples in the Hebrew Tanach, in the Talmud and in Byzantine and Roman writings from the Temple periods were forged, and that the Torah was falsified to claim Biblical patriarchs and matriarchs were Jewish when indeed they were prophets for Islam. "All this is not real. We don't believe in all your versions. Your Torah was falsified. The text as given to the Muslim prophet Moses never mentions Jerusalem. Maybe Jerusalem was mentioned in the rest of the Torah, which was falsified by the Jews.” He said Abraham, Isaac, Jacob, Moses, and Jesus were "prophets for the Israelites sent by Allah to usher in Islam." Asked about the Western Wall, Tamimi said the structure was a tying post for Muhammad's horse and that it is part of the Al Aqsa Mosque, even though the Wall predates the mosque by over 1,000 years. "The Western wall is the western wall of the Al Aqsa Mosque. It's where Prophet Muhammad tied his animal which took him from Mecca to Jerusalem to receive the revelations of Allah.” The Al Aqsa Mosque was constructed in about 709 to serve as a shrine near another shrine called the Dome of the Rock, which was built by an Islamic caliph. 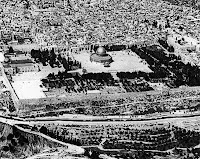 Al Aqsa was meant to mark what Muslims came to believe was the place at which Muhammad, the founder of Islam, ascended to heaven to receive revelations from Allah. Jerusalem is not even mentioned in the Quran. And yet Islamic tradition states Mohammed took a journey in a single night on a horse from "a sacred mosque" – believed to be in Mecca in southern Saudi Arabia – to "the farthest mosque" and from a rock there ascended to heaven. The farthest mosque later became conveniently associated with Jerusalem. The historical fact is the First Jewish Temple was built by King Solomon in the 10th century B.C. It was destroyed by the Babylonians in 586 B.C. The Second Temple was rebuilt in 515 B.C. after Jerusalem was freed from Babylonian captivity. That temple was destroyed by the Roman Empire in A.D. 70. Each temple stood for a period of about four centuries; moreover, archeology confirms this fact. THE BOTTOM LINE: This, in stark contrast to all of documented history, moreover, in the face of all physical proof from accredited archeologists, Islam has the audacity to stick by their own lying version of history, built on assumptions, unsupported beliefs, ignorance, and flat out fabricated lies. What is even more unbelievable is that ignorant people, who include the majority of the world, actually believe this dribble. The entire area was known as Canaan, which predates the nation of Israel. It was the country of Abram the father of the Arabs and the father of Israel later known as Abraham in about 2000 BC. Moreover, at the time of the Exodus of Israel’s captivity in Egypt sometime around 1200 BC, it was occupied by cities such as Jericho and Hazor there were no Palestinians. The last of the Jews were not dispersed from Israel/Judea until about 135 AD. All this occurred long before the Nation of Islam ever existed, since their satanically controlled prophet Muhammad was not even born until 570 AD. Around the same circa of the Egyptian Pharaoh Ramses III, the time of the Israeli Exodus, the Philistines arrived in Canaan in the area known as the Gaza Strip. An area formerly part of Egypt. The Philistines are believed to have come from Anatolia, an area now part of Greece and Turkey. Called the sea people some historians say that they came from the island of Caphtor now known as the island of Crete. Therefore, in anyone’s history book, one can easily see that nowhere in history does Hamas or the Palestinians have any historical claim to Canaan or any land anywhere in the Middle East or anywhere on planet earth. The people that occupied the area known as Palestine in the late 1800’s were not actually known as Palestinians. They were a combination of Israelis, Arabs, Jordanian, and Lebanese. They lived in relative peace even after the State of Israel was formed in 1947. Jordan kicked a bunch of rag tag terrorist out of their country and for the lack of a better place; they went to Lebanon, and called themselves Lebanese. As well as the area known as Palestine, and called themselves Palestinians. They claimed the land that Israel occupied was the historical land of the Palestinians; this was the beginning of the PLO and the occupation by the terrorist organization known as Hamas. Again, one can see that the Palestinians per-se did not exist prior to the invasion of the Jordanian terrorists. The area is now occupied by a combination of the descendents of regional-Arabs called Bedouins (or in Arabic, Badawi), regional Israelis, immigrated Israelis, some Lebanese refugees, and these Jordanian terrorists, Hamas or Fatah, who conveniently call themselves historical Palestinians. I guess they thought no one would check. What chaps my hide is that we even recognize these people as anything but what they are, Islamic Demonic Terrorists. I also find it interesting that the Arab people, who were at one time the most advanced nation in mathematics, today cannot even do simple arithmetic. It is, as if all reality stopped for them at the founding of Islam just before 700 AD.